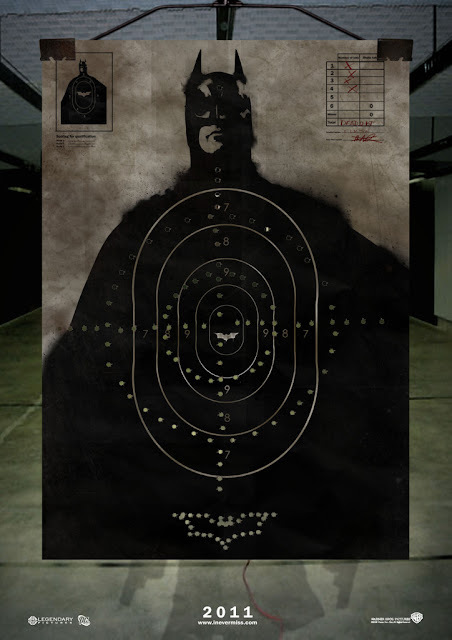 The bullet holes making the target scope and the bat logo are cool enough, without the website (inevermiss.com) and the Shot's signature on the marksheet teasing the looming showdown. If this was hanging in my movie theatre, I'd definitely be bugging them for a copy! ha! i just noticed the the shadow toward the bottom, nice touch. Love everything about this picture. I really would like Deadshot on Nolan's movie. I think he would fit perfectly. Agreed. So much more fun than Bane. I'm with the ladies. Better choice than Bane. Again though, I have faith in Nolan that he'll come through no matter who he picks. That man could write Bat Mite into the script and make it work. And Nolan will make it right, because he'll surely won't use Bat Mite. I loved the first two movies and am very hopeful next will be as good. Still I'll miss the Riddler. He could be just a detective Nygma. i bet tim burton or joel schumauker would use bite might. and it would be anything but cool i assure al of you. Imagine a Suicide Squad Movie, written by Nolan! If there is someone I believe would make a great job of it, it is him. No nonsense, great characters, and great story. Now whould he keep Boomerang? I think Boomerang would be in for sure Aliera - I like the Squad the more international it's membership grows. I think the whole concept works better when you picture the Wall as having that attitude and presence on every legal authority around the world as she yanks their hardest and worst out of lock-up for a suicide run. Boomerang would be a lock for the Ozzie supplement. I like your idea Dan (from one of Dave's posts). I think Simon Baker really looks the part of Boomerang. Craig, you're a man after my heart. Baker would be a perfect Digger Harkness.